If you want to make and receive VoIP calls, installing a VoIP service provider connection is essentially needed. With this, you can make and receive calls to and from landline, mobil, or even analogue networks through a VoIP provider on the Internet. Such a VoIP service provider connection can be used to connect to an Internet telephony service provider (ITSP) that offers digital telecommunications services based on VoIP. If you already have a PBX (Cisco, Asterisk, PBXnSIP etc.) system and you want to keep it but you would like to use the functions of the Ozeki Phone System XE, you can connect them easily. 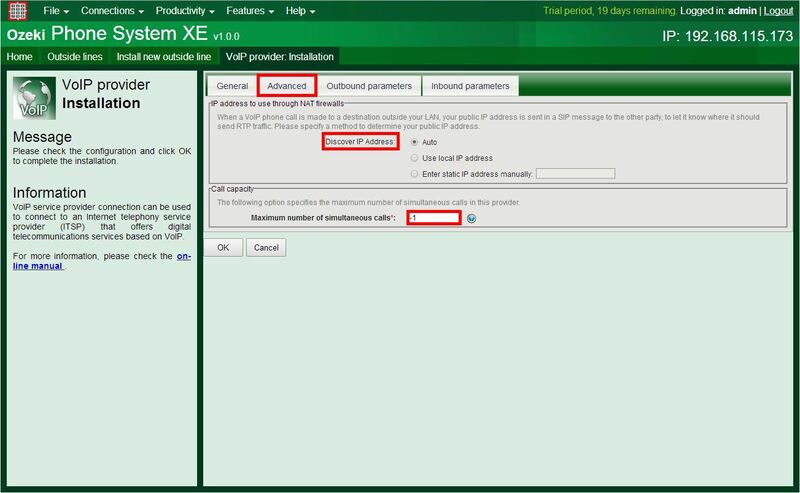 If you follow this guide, you will be able to setup a VoIP service provider connection in the Ozeki Phone System XE in an easy and fast way. Note: Please choose the VoIP service provider that offers plans best fitting your corporate needs. Once you have subscribed to its service, the provider gives you access to its network by providing all the connection information: hostname, port, user name and the password. You will need to enter this data into their respective fields in the Ozeki Phone System XE during configuration. If you or your corporation already have an operative PBX but you would like to use the useful and particular features of the Ozeki Phone System XE you can easily connect them by using the Ozeki Phone System XE VoIP service provider. It is also useful when you want to connect your system to an outer service to make and accept calls by using outside lines. It could be very effective to use the features of the Ozeki Phone System XE like the sending and receiving SMS messages besides VoIP calls and services and you can use the benefits of the Ozeki's Webphone. By connecting a webphone to your PBX you can make it possible for your customers to reach your support staff easily. Any web browser is capable of handling microphones and web cameras, making voice and video chat become available. And the visitors of your website can call your corporation for free because they can connect to your phone system. You may find that you have an analog/digital PBX and you would like to make calls to outside telephone networks (e.g. GSM network) or you just want to call a VoIP desktop phone or a softphone, this is a very good option to use the features of Ozeki Phone System XE. You can read more informations about the connection between your PBX and the Ozeki Phone System XE on this site where you can learn how to connect various PBXs with Ozeki Phone System XE. A VoIP connection consists of a VoIP Service Provider and the devices connected to it. The VoIP Service Provider offers internet telephony services to the customers at a monthly rate. The advantages of VoIP calls are that these calls are made over a high speed internet connection, rather than over a regular phone line, so this technology is much faster, stable, and provides a better sound quality. The devices can call each other within the range of the VoIP Provider, and they are also able to dial devices which are outside of it. This is possible, because you can connect multiple VoIP Service Providers to each other, and you are able to make cross-dialling possible between all of them. The configuration of a VoIP service provider connection in the Ozeki Phone System XE is necessary to be able to make and receive phone calls. A VoIP service provider connection makes it possible to connect local phone numbers of one or more cities or countries. VoIP service providers often can provide higher quality services than standard PSTN (Public Switched Telephone Network) systems and they offer more functionality. 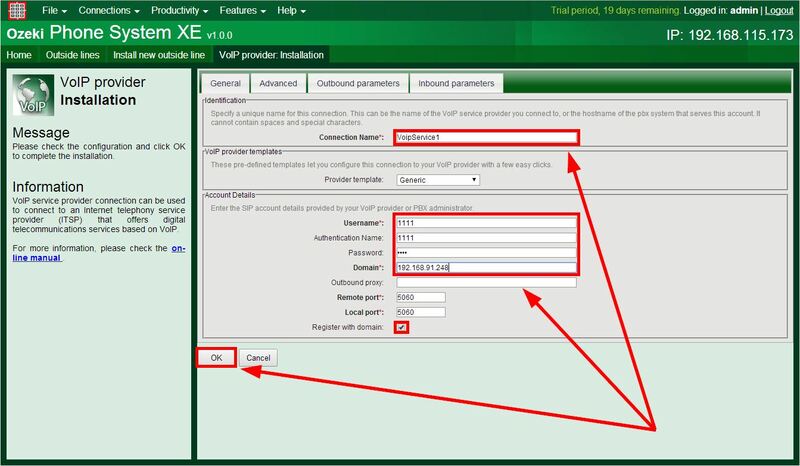 Please follow this step-by-step guide in order to configure a VoIP service provider connection in the Ozeki Phone System XE effectively. 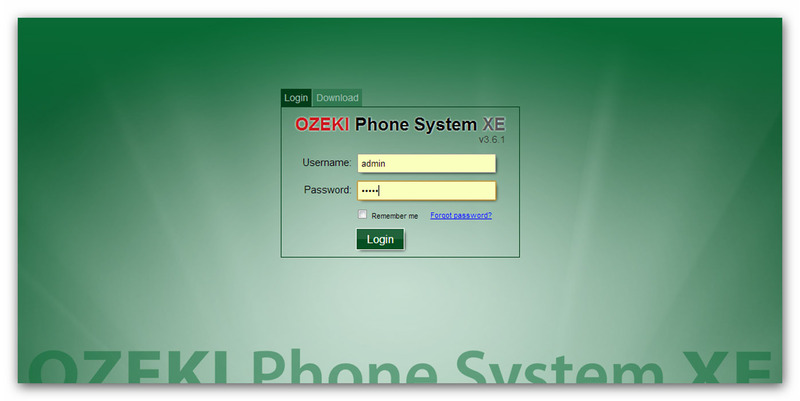 First of all, start the Ozeki Phone System XE and log in with your username and password (Figure 2). Click on Add at the Outside lines section (Figure 3). Then click on Install next to the VoIP Provider row (Figure 4). Username: This will be your username for the VoIP Service. Using this, the Ozeki Phone System XE will be able to connect to the VoIP Service Provider, in a similar way like a softphone extension does. Authentication name: This name is usually the same as the username. 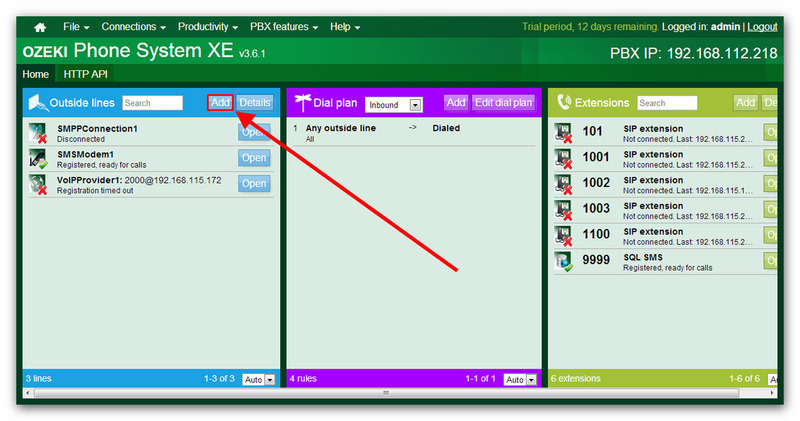 It makes managing multiple services and extensions easier in the Ozeki Phone System XE. Domain: This is probably the most important data field. Here you have to provide the IP address of your VoIP Service Provider, to make it possible for the Ozeki Phone System XE to identify the VoIP Service Provider. The VoIP Service Provider will give this data to you. Remote and Local Port: The 5060 port is for the Session Initiaiton Protocol. Register with domain: If you uncheck this option then you can only start outbound calls and you can't receive inbound calls through this connetion. This section you also can specify the maximum number of simultaneous calls. If it is -1 then the number of simultaneous calls is unlimited. For example you have set this number to 2. Then you only can start or receive 2 calls at the same time, no more. After providing the information click on the OK button at the bottom of the screen. You have created a softphone extension(number 1001) in the Ozeki Phone System XE, and you are calling another softphone extension(number 2200) from it, which is connected to the VoIP Provider extension. You can see information about the call in the VoIP Service Provider Log. The Figure 5 above is quite self explanatory: Incoming call received means that the Ozeki Phone System XE got the call from 1001 to 2200. Call established tells us that 1001 called 2200, through VoIPProvider1. Due to the Ozeki Phone System XE you can make VoIP calls from any communication devices achieved by a VoIP service provider. A VoIP PBX allows you to make connections regardless of place and time, by integrating communication devices. 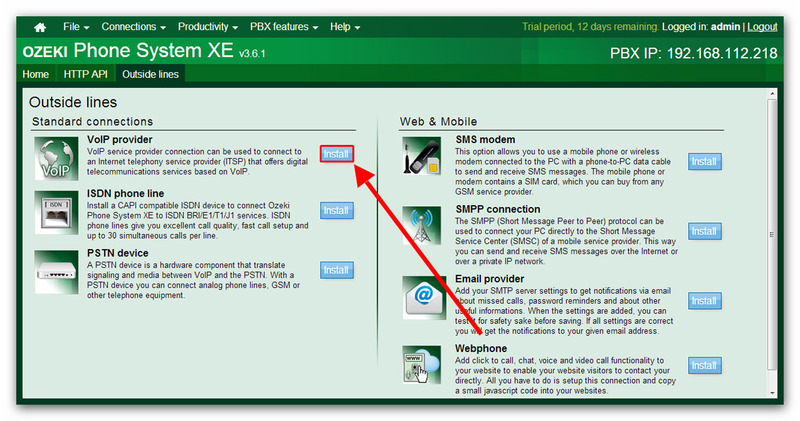 Following this guide, you will be able to connect a VoIP Service Provider easily to the Ozeki Phone System XE in a couple minutes.